We manage our clients’ legal affairs and instruct global industry experts. Whatever legal issues confront our clients, be it individuals or corporate entities, as general counsel we dedicate ourselves to providing comprehensive advice which is specialised, cost effective and responsive. As the primary point of contact for all our clients’ legal matters, we ensure our clients’ business is prioritised and managed in a timely and cost effective manner. Each client has different requirements and requires different levels of service and involvement. Some clients may only want us to make an introduction – others are only interested in seeing the final result. This model of work means that most fees that you can expect to pay will be paid directly to third parties whom we assist by managing them and communicating with them. Consequently, fees charged for the entirety of the transaction will vary from one client to another and will depend first and foremost on the third party chosen and the degree of involvement the client wants us to take in each particular transaction. Where we introduce you to, or instruct, other solicitors in the UK on your behalf, who are regulated by the Solicitors Regulation Authority, you will be able to look on their websites for details of their prices, details about their service, their terms of business and how to make complaints. The agreement which you enter into with other UK solicitors, or which we enter into on your behalf will usually be set out in a detailed Client Engagement Letter which will also make clear who will be doing the work on your behalf, their seniority and level of expertise. We may receive payment from the third parties for our introduction of the work to them, however we will always tell you about this and you can find out more about our obligations in this regard here. Any payment we receive will not affect the price you are quoted by the third party and you will always have all the information you need to make an informed decision about whether or not you want to instruct us or any of the professionals we introduce you to. When you instruct us to assist you with your matter or to oversee your legal affairs, depending on the level of service you require and what you have instructed us to do, our agreement with you may include a fee for our services. We will advise you what this is likely to be at the outset and we will either quote you a fixed or agreed fee, or we will charge you based on our hourly rates. We offer fixed fees for the majority of the work that we provide. A fixed fee is an agreed fee, which will not be varied up or down, and is not dependant on the outcome of your matter. Any disbursements or expenses (costs that we incur on your behalf or for the purposes of carrying out our work) are payable in addition to our fees. In the event of your instructions being withdrawn prior to the conclusion of your matter, the fixed fee, together with any disbursements and expenses, will remain payable in full. We also work on hourly rates. Depending on the work you instruct us to do we may charge by the hour. The rate that we charge, or bill, per hour is dependent on the seniority and expertise of the person undertaking the work. It may be cost effective to have a range of people on differing rates working on your matter, having more junior people doing the basic, routine work and a more qualified person making the strategic decisions and overseeing the work of the juniors. Below is a guide to the hourly rates we charge for people of differing seniority and expertise. Our hourly rates for our professionals is set out below. At the start of each instruction, we will provide an estimate of how many hours we expect will be spent working on your matter and we will give you an estimation of the cost. It is always difficult to accurately gauge the costs of a case where we charge by the hour as this can vary depending on new information, underlining issues, complexity of the matter etc. In these cases we will try to provide you with estimates for each stage. Where we provide an indicative fee range or estimate, it operates as a guide and not a cap. Estimates will be based on a number of assumptions and if we encounter unforeseen work or complexity this may cause our fees to increase above any fee range or estimate provided. You must not consider them to be maximum or fixed-fee quotations. We will give you the best information we can about the likely overall cost of the matter at the outset and at other appropriate times. We will always inform you of who will be working on your case and their hourly rate. Please note that we record and charge for our time in 6-minute increments. More complex matters may attract higher fees, and we will always advise you on this. Although we offer assistance across the broadest range of issues, there are some areas of work, where we are able to provide accurate fees guidance and this is set out below. Please note however that unless specifically stated, the following additional costs are not included in the fees in our guide. These fees represent our professional fees; in other words, this is the amount that we will charge for the legal work that our firm will undertake on your matter. Due to the individual nature of each matter, the services provided to each client may differ. Generally in each standard matter, our services will involve advising you about the relevant law and procedures, preparing the necessary documents on your behalf, liaising with you and third parties (where necessary) on your behalf and generally dealing with your matter to its conclusion. In-house Translation Fees; In the event that any translation work is required to be done in your matter, in-house translation work will be charged at an hourly rate of £65.00 plus VAT per hour and £85.00 plus VAT per hour for any translation done outside of our normal working hours. General guidelines on fees and procedures in key practice areas. While the precise fees we quote to our clients will differ based on various factors, below is a generalised summary of them. Each potential client will be provided with a fee estimate or a fixed fee quote based on their individual circumstances. We are often asked to assist in property transactions and our involvement can be limited to managing an agreed transaction or can include finding a property and conducting negotiations for its purchase. This will of course affect the time spent by us on the matter and, consequently, our fees. Our fees cover all of the work required to engage, monitor and facilitate the effective work of conveyance solicitors and other third parties. We would typically obtain quotes from a number of potential third-parties (including, if required, agents or solicitors to conduct Searches, Conveyancers’ fees etc), ensure that strict deadlines are set, documents are made in a timely manner and correctly and that all procedural steps are complied with. Our services often include preparing background documents for the client (identity, source of funds etc) in a way that would make their review by third parties easy and time-wise efficient. The range of our quotes could be anywhere between 5,000 GBP and 25,000 GBP per transaction, depending on the complexity, value of the property, purchase structure chosen and quick availability of the source of funds documentation. Below you can see how our services will typically be structured on a residential property transaction. We are often asked to assist with preparing applications for US B1/B2 and F1 visas. We have a significant amount of experience in both categories and are eager to help our clients with those applications. Any visa application has two stages: preparation (when we fill in the forms, obtain the support documentation and provide clients with a clear list of outstanding requirements) is the first one. Our fee for the preparation of the documentation pack for the B1/B2 visa is £2,500, for the F1 visa it is £3,500, unless there are circumstances that require additional work to be carried out (previous refusals, trips to higher risk regions etc.). 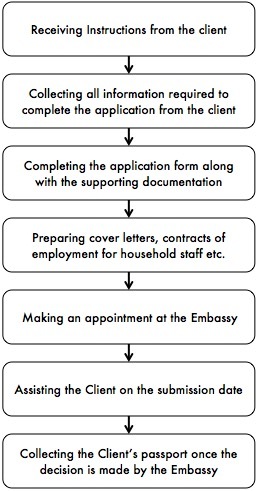 The second stage is the physical submission of the application to the Embassy. The client may choose to receive our assistance during the submission process. If the client chooses to request our assistance, this would incur an extra fee of £250. We can assist with a range of Schengen visas with our typical rate being £2,500 per application. This may vary based on the complexity of an application (past refusals) and the amount of supporting documentation that needs to be re-issued/produced. The fee will also differ for various categories of Schengen visas – longer term visas can often require more work and be more expensive, while visas for EU citizens’ family members typically require less work and will therefore often incur a lower fee. Should the client choose to receive our assistance during the submission process, this would incur an extra fee of £250. We can assist with all types of Russian visa applications and pride ourselves on being able to deliver an extremely expedient service. Our typical rate is £2,500 per application for a multi-entry one year long visitor or business visa. This can increase if a visa is requested for a longer period, under a different category or in shorter than standard time frame. For this type of visa, submission assistance is included in the fixed price. At the outset we will provide you with a Client Engagement Letter, which sets out the work which you have instructed us to undertake and the anticipated cost, as well as any other costs that we expect will be associated with your matter. We are always happy to explain the various steps and how the total costs have been calculated. Once you have received our letter, there is no obligation on you to instruct us further if you do not wish to. If you do agree with our terms, you will be asked to return a signed copy of the letter to us. Our Client Engagement Letter will also set out when our fees are due, and when you will have to pay any other fees or costs. In most cases you will pay those fees to us and we will pay them to third parties on your behalf. It is important to note that our Client Engagement Letter clearly sets out the scope of the work we have agreed to do for you and the price quoted is for our services up to the point that we have set out in the Client Engagement Letter. If there are further steps you would like us to take, we will provide you with a further quotation for those services. The Client Engagement Letter will also set out all the other terms of our arrangement with you and wherever possible we will also provide you with an estimate of how long it will take to conclude the work you have asked us to do. Where necessary, helping you obtain further evidence (such as medical records, the opinions of experts). The costs associated with obtaining this evidence are usually in addition to any fixed fee, or hourly rated estimate we may provide. If your matter is unsuccessful and you need to make further applications or submissions in order to achieve your aim, we will advise you on the additional costs before undertaking any further work on your behalf. To be clear, the costs of appeals, administrative or judicial reviews are not included in the price guide provided below. We will always provide you with our estimate of how long it will take to deal with your matter. This will be dependent on various factors, such as the complexity of the matter, courts or tribunals involved and jurisdictional issues. Of course, time frames can vary, and if we foresee that the process will take longer than initially anticipated, we will keep you updated at all times. At Discreet Law we are committed to providing a high quality legal service to all our clients. When something goes wrong we need you to tell us about it so that we can resolve the problem and continually improve our standards. Within three days of receiving your complaint we will send you a letter acknowledging receipt. We will provide details of who will be dealing with your complaint, and when you can expect to have a response. It may be necessary at this stage to ask you for more information, or to invite you to meet with us to discuss your complaint. We will record your complaint in our central register and will investigate your complaint by reviewing the relevant file and the issues you raise. The member of staff who acted for you may be required to provide further details. We will then provide you with a detailed written response to your complaint and this may include our suggestions for resolving the matter. We will aim to do this within five days of acknowledging your letter. If your complaint is very detailed, or your matter has been very complex, it may take us longer to complete a review and to respond to you, but we will keep you advised if this is the case. Once again, it may be necessary to ask you to come in and meet with us in order to discuss your complaint before we are able to respond fully. Within three days of any meeting we have with you we will write to you to confirm what took place and any suggestions we have agreed with you. At this stage if you are still not satisfied, please let us know. We will then arrange to review our decision. We would generally aim to do this within 14 days. We will then write to you confirming our final position on your complaint and explaining our reasons. We will always do this within eight weeks of receiving your complaint, unless there are exceptional reasons why we cannot do so and we will keep you advised if this is the case. If you are not satisfied with the our handling of your complaint, you can ask the Legal Ombudsman (contact details below) to consider the complaint. Normally you will need to bring your complaint to the Legal Ombudsman within 6 months of receiving a final written response from us about your complaint. Not explaining the issues properly so you do not understand. Treating you unfairly because of your age, disability or other characteristic.